One aspect of my life that I don't really share much about is my personal life, and if you've been a long time follower of my blog or if you follow me on Instagram then you'll know that I actually have a couple of pets! Maisie, my dog is a massive part of my life, as we've now had her for six years and just like every other dog out there, she is absolutely spoilt rotten. So when Pawsomebox contacted me to receive one of their dog subscription boxes, I couldn't not turn it down as I knew she'd absolutely love it! As the name would suggest Pawsombox is an awesome subscription box designed for dogs that you essentially sign up for and receive one box per month for as little as one month, and up to twelve months. What is great is that you can totally customise their boxes to suit your dog based on it's size, fur type and also it's age, so that the team can then select the perfect gifts and treats for your dog. Each is then individually hand packed with a selection of six products including toys, treats, pampering products and also a few miscellaneous products. The box that I was kindly gifted was their December box, so it was obviously themed all things Christmas and with it being the month of giving I actually received eight products within this box, which I was really impressed with and Maisie was definitely pleased to receive some new toys and treats just in time for Christmas! The box itself was made out of a sturdy and good sized cardboard box, with all of the products wrapped within a really cute sheet of tissue paper along with a little magazine/brochure all about the box and few other articles on all things dogs! When I first got this home, Maisie was so excited as she loves assisting when it comes to opening Christmas presents that aren't for her, so the fact that she could smell the treats inside the box was enough for her to know this was for her. So onto the actual contents of the December box, and as i've already said I was really surprised with the amount of products Maisie got in this box. For toys, she got three very cute and exciting Christmas themed toys including the Pet Brands Rudolf The Reindeer, which is a stuffing less toy that I personally prefer over stuffed toys as they create less mess when dogs eventually destroy them, but it does have a squeaker in it to keep her occupied. The other two toys are both rubber squeaky toys, one of which is a cute Pet Brands Vinyl Penguin and the second is a Pet Brands Vinyl Christmas Cracker that Maisie absolutely loves as she rather enjoys toys that squeak, as she enjoys making herself known. I personally love Christmas themed dog toys at Christmas time, especially if you love getting into the festive spirit and it means your dog can get into the festive mood with you! Moving onto the treats within the box, and I was really intrigued by the treats in this box as i've never seen or heard of any of these treats. Now my dog being as spoilt as she is hadn't tried any of these until it came to writing up this post as she received far too many treats over the Christmas period. Firstly we have the IAMS Minis Beef & Apple Dog Snacks, which sound very festive in the flavour and these treats are designed to be somewhat healthy as they are gluten free, low in fat and contain no added sugar, and Maisie sure did enjoy the few of these treats I gave her. Another Christmasy themed treat within this box was the Pet Brands Christmas Assorted Biscuit Favourites, which is a Christmas cracker shaped box containing an assortment of different meat flavoured biscuits that we've been adding into her dinner once or twice a week, as a little treat when she's been good! The last of the treats is the Trixie Rice Chicken Balls, which as the name would suggest is a treat containing rice and chicken and I assume these are slightly more healthy in comparison to other dog treats, but Maisie absolutely loves these so they must be really tasty! Onto the last few bits in the box, which are somewhat uncategorised but always come in handy when it comes to having a dog. If you have a dog like mine who loves swimming, then you'll know how muddy and dirty your dog can get so the Plouf Universal Shampoo is definitely going to come in handy, as it's designed to be used on pretty much all breeds, and is made from grape extract which helps to cleanse but to also boost shine in your dogs coat, so we'll see how that goes! Lastly we have some Pet Brands Festive Waste Bags, which I think are just hilarious but so funky! What's better than some brightly colour waste bags in order to clean up after your dog?! So those are the contents of the December PawsomeBox, and for my first box i'm really impressed and Maisie for sure was very happy to receive some new treats and toys! 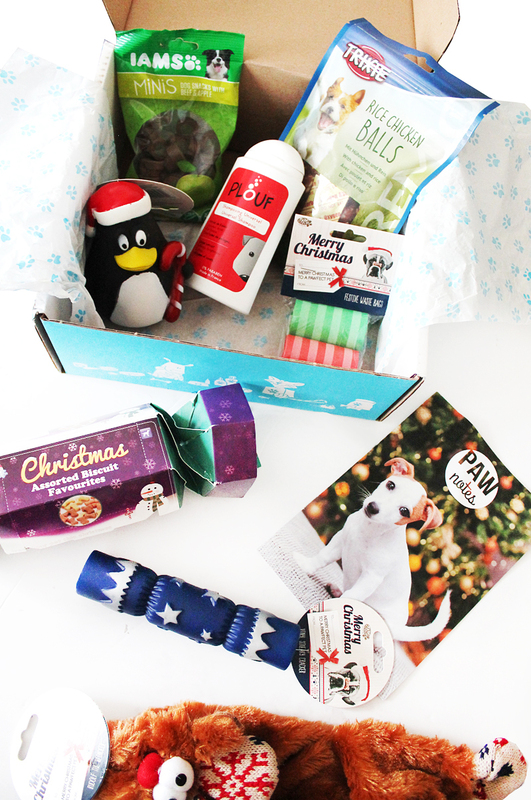 If you love spoiling your dog, then i'd highly recommend checking out PawsomBox or if you have a cat, they also do the PurrfectBox designed for cats, and for less than £20 (depending on your subscription plan) a month you really do get an amazing variety of products! 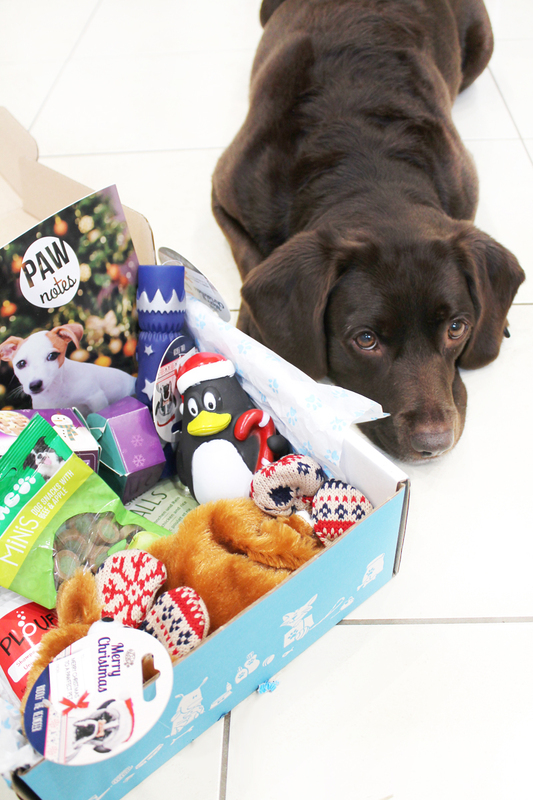 If you're linking of subscribing to Pawsome, make sure to use the code 'ukb1ocec' for a £5 discount on your first box! Have you treated your pets to any subscription boxes?